The Guardian said it was the last ice area, and it was scary. The whole story was complete nonsense. There was less ice north of Greenland in September 2002 than there is this year. The Arctic is full of ice. The red circle shows the area which climate scientists are terrified about. 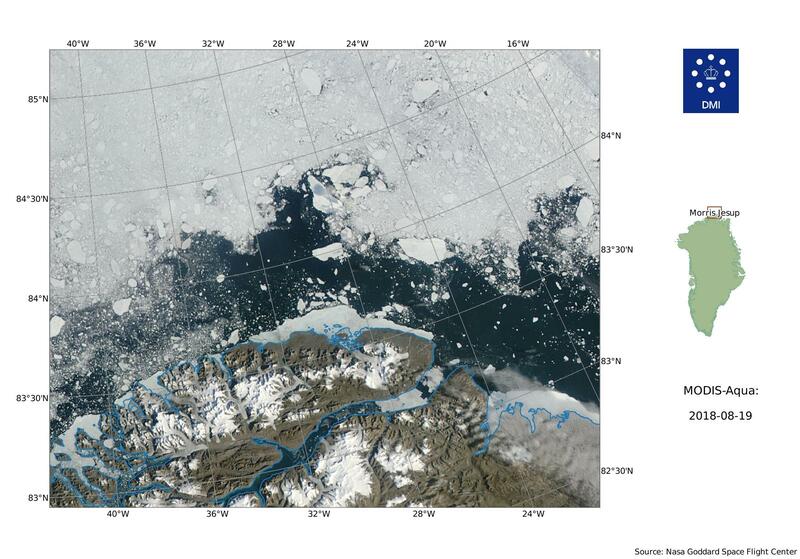 There is more ice across northern Greenland than there was ten years ago. 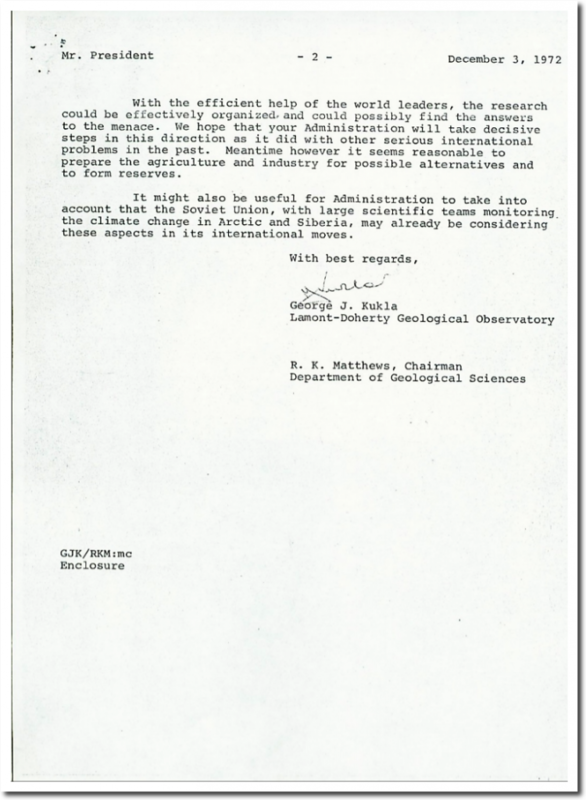 Across the entire Arctic, sea ice extent is slightly less than 1971, during the ice age scare. 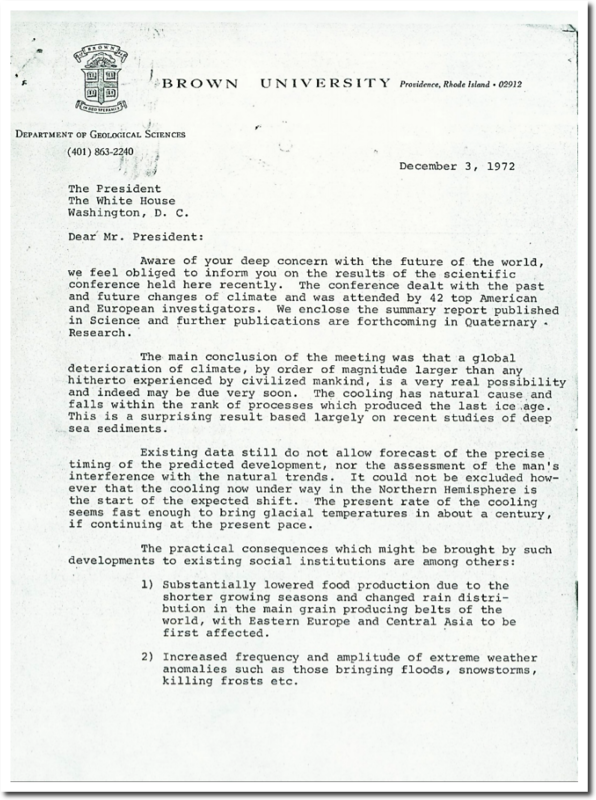 Forty-nine of the world’s leading climate scientists sent a letter to President Nixon warning of a new ice age within a century. As far as I can tell, most national and international news agencies lie about essentially everything. 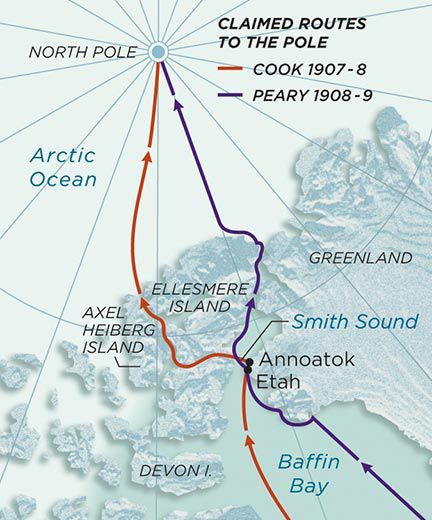 Robert Peary docked his wooden ship the Roosevelt at the northern end of Ellesmere Island in the Summer of 1908, a hundred miles or so NW of this location, on his way to the North Pole in 1909. Anybody who has read about polar exploration knows this story was a fraud. I wonder if there is an active underwater volcano there? Anyone know a way to find out? There are volcanoes and underwater hydrothermal vents in many Arctic places. If you do a search you will get many results, some more interesting than others. Sorry, after I posted the above it occurred to me that you are referring to the “last ice area,” which is Guardian nonsense. Anyway, one could do the same kind of search for that specific area. The area referred to in the original article was about the ice off Kap Morris Jessup not the area that Tony marked with his red circle which is instead the entrance to the Nares Strait, which frequently opens up due to flow through the strait. 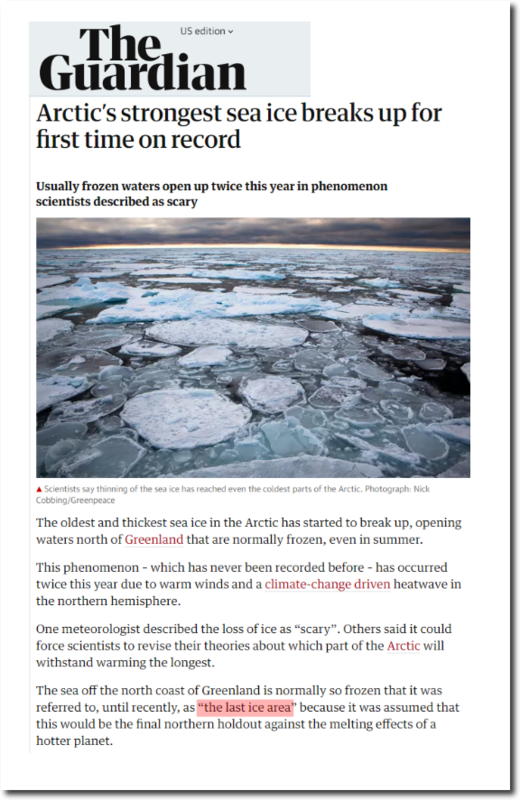 The Guardian referred to the ice as ‘the Arctic’s strongest ice’, the ‘last ice area’ was a quotation of someone else by the Guardian. You mean here, where there is more ice than ten years ago? 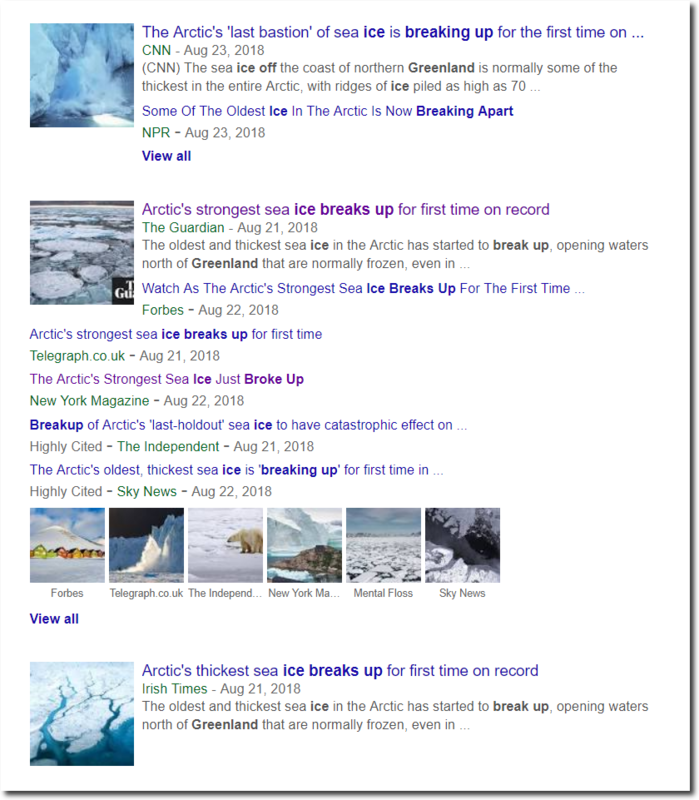 The Guardian referred to the ice as ‘the Arctic’s strongest ice’, the ‘last ice area’ was a quotation of someone else by the Guardian. Phil, how cold is the water you carry for the Grauniad? Is it scary? I think it must be scary. This is hysterics over the wind blowing to the North through the Fram Strait and causing as temporary lift-off of the ice along the northern coast of Greenland for a week or two. It’s transport NOT melt. The transpolar drift usually keeps that ice in that area creeping to the east and southeast and then out the Fram Strait. 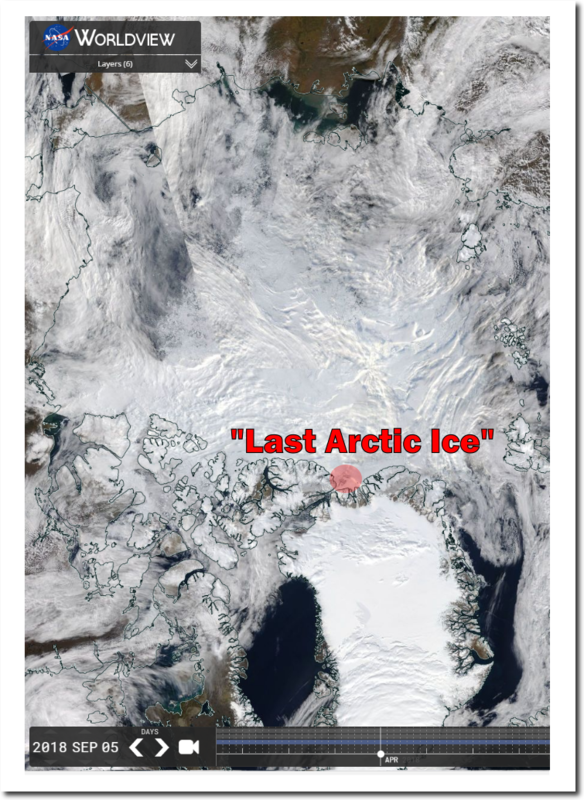 Over the last year, or two, the winds have shifted dramatically and are persistently pushing the ice toward the pole along the Atlantic side and greatly reducing the flow out of the Arctic through Fram. The result is low Greenland region ice levels and a significant retention of MYI in the basin–because it’s not being pushed out into the Atlantic. This started in 2017 and continued through 2018. It is the exact opposite flow pattern that dumped the MYI in 2005 to 2008 into the Atlantic. If it persists, the alarmists will be screaming in the coming years as the basin repopulates with MYI. This year was a distinct step in that direction, 2019 will be very interesting. Back in the 1920s, stadiums had larger playing fields than today’s stadiums. The outfield fences averaged about 30 feet further away from home plate at that time. It makes Babe Ruth’s home run record more impressive once you think about it. In 1920, the Yankees were playing in the Polo Grounds and Ruth hit a fly ball 490 feet which was caught for a routine out. Ty Cobb was the guy who caught it. Bill Jenkinson has a book on Babe Ruth that gives all the details. A bit off topic, but here is a nice interview discussing bad science and poor peer review. The speaker is an Australian expert on the Great Barrier Reef, who has been involved in extensive disciplinary actions because he has criticized the reliability of some college’s work. Obviously the sheeple are bombarded with fake news all the time, designed to separate them from their money and freedom. In the meantime phony advocates like Gore and Dicaprio continue to live in luxurious mansions and jet around the world in their private planes. Until they give those up, they are nothing but the worst sort of hypocrites. IDK dude, looking at the 2002 vs 2018 picture, it looked like there was slightly more ice in 2002. Your desperation is showing… dude. Dude thinks more ice before. Dude thinks scary. All die. Kukla died in 2014, still unrepentant about ice ages.